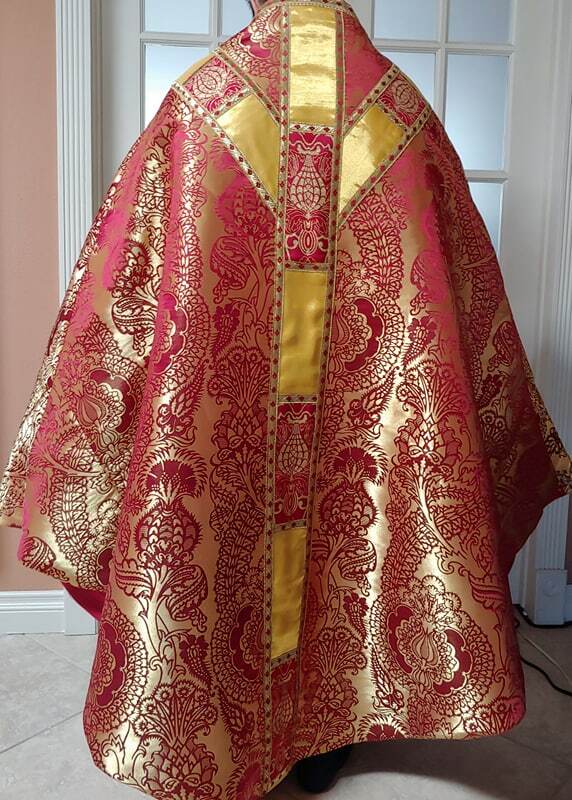 We seem to have a sudden influx of red vestments coming from the bespoke vestment makers and this one is no different, a red conical chasuble coming from Paramentica. The timing for these offerings are, of course, opportune if any parish, priest or monastic/religious community is looking for a new set of vestments for the forthcoming feast and octave of Pentecost. Made to order. Sizing and dimensions are customizable. Each order takes ~4 weeks for completion. 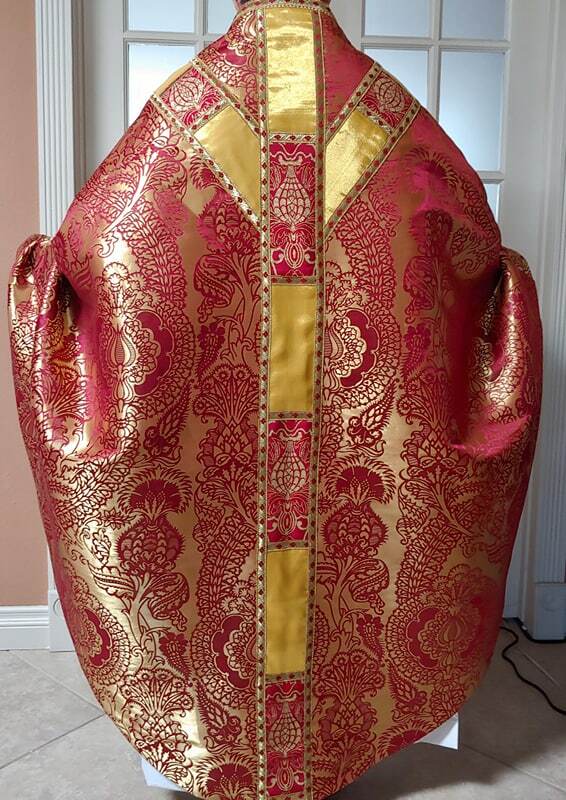 I have always had an interest in the conical form of the chasuble. This particularly ancient form of the chasuble can be difficult to execute just as it as can be difficult to wear. For it to come off properly, it has to both be designed properly and one also has to know how to wear it properly. Provided both criteria have been sufficiently met it can be quite a fetching form, particularly in monastic settings as well as those heavily influenced by the Romanesque. However, their applicability extends well beyond that of course, including within the context of the Other Modern. 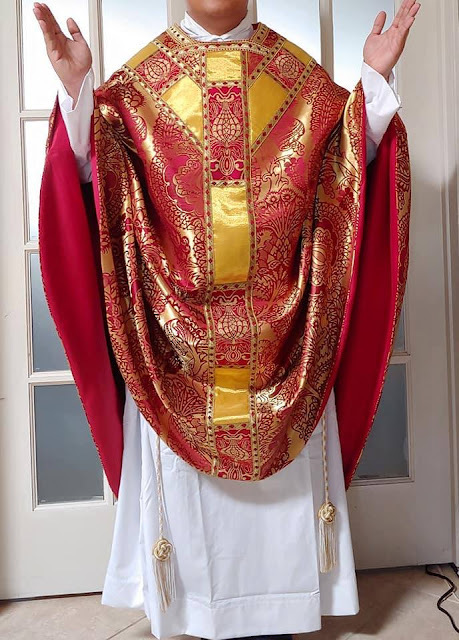 In the case of Paramentica's chasuble, without having the ability to inspect it personally or to see it in actual liturgical use, I can say that the material looks as though it is not too stiff, which is an important design factor for a conical chasuble if it is to fall gracefully. Generally I subscribe to a school of design for these which would usually incorporate very thin orphreys (which, to my mind, emphasizes the ampleness of this form) but this wider orphrey design works for me as well. I particularly like the incorporation of the trims that form the outer edges of the orphrey; these smaller details provide a necessary bit of 'counterpoint' to the larger designs found elsewhere in the design.